Oz's travels. - GDSF 2018. Well we start of this report with the customary ready to roll photo, but its changed again. Last year we had the trailer, this year we have the wobble box. Can I say now that Phil always looks forward to the Great Dorset Steam Fair, this year he was on edge due to the loss of Mark Gass Brown aka Squirrel back in January. In July Phil covered the commentary at Welland Steam Rally. Squirrel was the face/voice that everyone saw/herd every year at Welland. If anyone took note of Phil he was a chap in red overalls connecting or disconnecting the tractors to/from the sledge. Now he had the mic and everyone's attention. Some people don't like changes, so he trod carefully over the weekend. Phil has always loved a challenge an tackled this one head on. I was so proud to see him succeed. Now getting back to Dorset, Phil an Squirrel worked together to do the commentary, this time Phil thought he was going to be on his own. He wasn't, Norman and Madeleine Young has asked Carol West from the Cornish Tractor pullers to lend a hand, he very much appreciated that, now that's enough chit chat, lets get on the road. As soon as we came down the slip road on the M40 motorway at Warwick I couldn't Adam an Eve it...… we rolled in behind two wobble boxes heading south..... "breaker 1-9 breaker 1-9, Mercy sakes alive, looks like we've got us a convoy"
Made it down in good time an soon set up in the tractor pulling section. I think we are going to be proper cosy this year Hue, I don't know where Phil's going to kip though. Security is always pretty good at Dorset, here is one of the best, with the best name aswell..... meet Oz, yes Oz! The Sunday evening was warm and the show ground was quiet so I went for a wonder. Not to far from the tractor pulling they had set up the scrap yard. But with all the old scrap yards there's always a watch dog. I don't think I will get too much trouble with this one. They have got a fair mix of stuff from a fair mix of countries, for starters this stationary engine from ……. Chile. W.R. Grace and Company is an American chemical conglomerate based in Columbia, W.R. Grace and Company was founded in 1854, in Peru by William Russell Grace, who left Ireland due to the potato famine, and travelled to South America with his father and family. Wikipedia comes in handy sometimes. I had to "crane" my neck to look over this one. boom boom..... sorry. Now this was a surprise to see, a Kings Class locomotive. Humm this chassis I'm stood on is or was and maybe again with a few more bits, is a Dennis lorry. How do I know? Oh I can tell by the shape of the chassis rails, plus the design of the front axle...…. But what really gives it away is the name plate on the back axle. 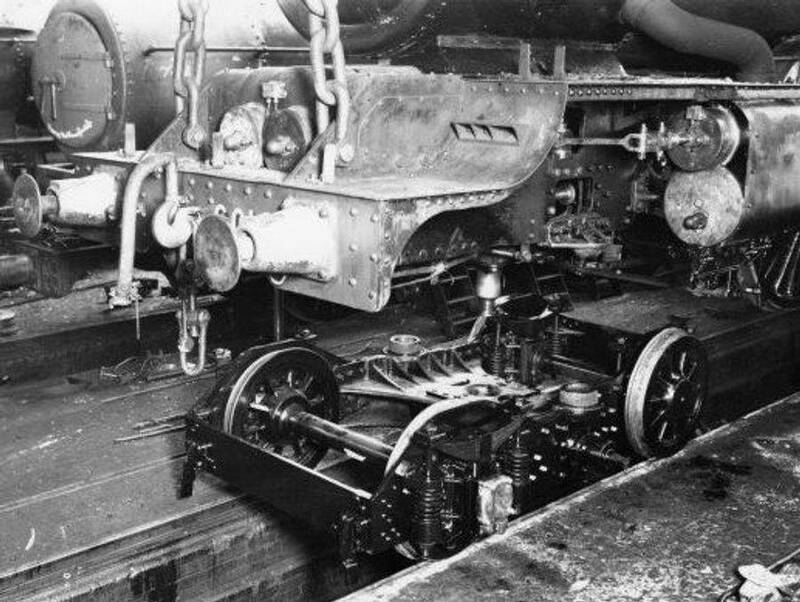 Sod the health and safety lets have a proper look under a railway locomotive. Stood under the pin that the front bogie is attached too. I have found this photo of a Kings Class being lifted off its bogie...… not that sticky then, like the ones that I get stuck on my claw. You can see the hole where the pin drops into. Piston... NO! that's paint over spill! Just imagine how much pressure has been generated through this pipe over the years. Now this is what I see most days, a pile of rusty metal. I can get a lorry in tomorrow to shift it, a call to my mate Matt Holloway at Joseph Holloway Ltd Oldbury. Its is a shame to see, strange thing though is, even in this state it still looks impressive. I don't know if any of these will ever be restored, I think that they will never be cut up though. Another stationary engine from across the water. The rustic corrugated iron living van. The floor don't look to bad but the running gear could do with a blob of Hammerite. Not a steam roller, but an early one with an engine. They have got to be very early stationary engines with those wheels. This would be handy to grade the tractor pulling track. An engine from America, J I Case Company, 700 State Street, Racine, Wisconsin, founded in 1842 by Jerome Increase Case. Case was one of America's largest builders of steam engines. I will say a very impressive engine. Us Brits go for practicability but the Americans do go for detail, look at these steps. A Marshall Roller caught my eye, Simon my mate from Lancashire lives with Bob Marshall, so I sent him these photos to see if he an Bob would like a challenge to get this back on the road. He past the challenge back on to Phil... Humm...... it takes Phil two years to think about any Job before starting... so maybe not! he he. Phil was very interested with this riper on the back. It was manufactured in Cowley Oxford. About half a mile from where the Sheds..... sorry BMW MINI's are assembled. Another small fact Phil used to deliver the beer and soft drinks to the social club on the BMW MINI site when it was Rover back in the 90's. I think it may need a new set of pipes. We used to deliver the coal to Mid Hants Railway, one of the better jobs we used to have at R.Adams & Sons, see..... 'me and steam' page. This locomotive looks interesting can't wait to see with out the cover and in action. 'FODEN' one of the best BRITISH lorry companies, shame no more, but with the other best BRITISH lorry compony 'ERF', (that got bought out by MAN) the lorries are still about and working hard, mostly in the fairground community and seen a lot as shunters around the docks, also lovingly restored by enthusiasts, like this 1931 12 speed steam lorry. Look at the interior of the cab, well polished. With the water tank being there, you would want to be shunted up from the rear...… Oooooo nasty. Short wheel based 6 speed version. Hello, I recognise that roller, 'hit the music!' "A WHOLE LOT OF ROSIE"
Arrrrr I've been in this position a few times after a drop of the cloudy stuff. I do look forward to the steam rally at Much Marcle. (Weekend before Welland Steam Rally in July) I will have to do the tour of the Weston factory one day. Page one done...…. right when your ready hop over to page two.